Oh, don’t worry. There is no shame here. It is okay to start drooling after reading the title of this one. I know I am, at least. 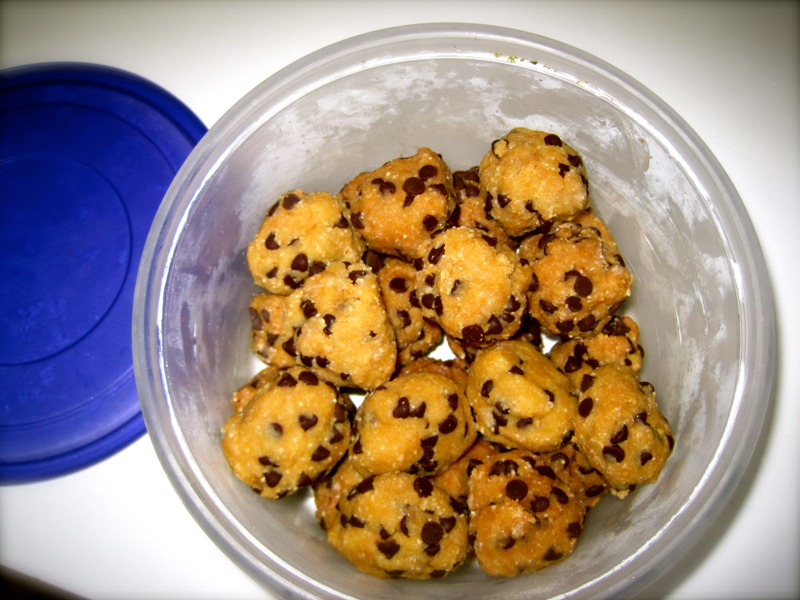 Mmmmm chocolate chip cookie dough goodness. These are just amazing, and my formal taste testers (also known as my parents) can vouch for the mouthwatering deliciousness in each bite. I am going to be honest–the Paleo Diet is HARD. Especially with the additional limitations (including eggs, which I hadn’t mentioned before). I will post more about what I’ve been eating, and it is all very delicious (thanks to my wonderful parents who are filled with eagerness to help), but the novelty of a new diet wears away quickly, and meat and vegetables every day eventually gets old. I am thrilled to announce that I will start reintroducing foods in a week and a half! I’ll start with eggs, then move on to grains, and go from there. I think I’m looking forward to bread more than anything. That being said, I have an enormous sweet tooth, and I honestly do not think I would have been able to survive the Paleo Diet without my daily chocolate fix. This giant batch of (relatively) guilt-free truffles should keep me going for a while. The recipe I used is here, but to make it Paleo-friendly I subbed coconut oil for the butter. I also only had 2 cups of almond flour on hand (I guess that’s what happens when you don’t plan in advance), so I ended up using more coconut flour in mine. Sinfully delicious, minus the sin. I only had one problem with this recipe: the excruciating wait I had to endure while they firmed up in the fridge so that I could dip them in the luscious chocolate (and then waiting again for that chocolate to cool). HOW CAN I BE EXPECTED TO WAIT TO DEVOUR THESE? Fortunately, I managed to find a way to pass the time by working on my best friend’s birthday card. 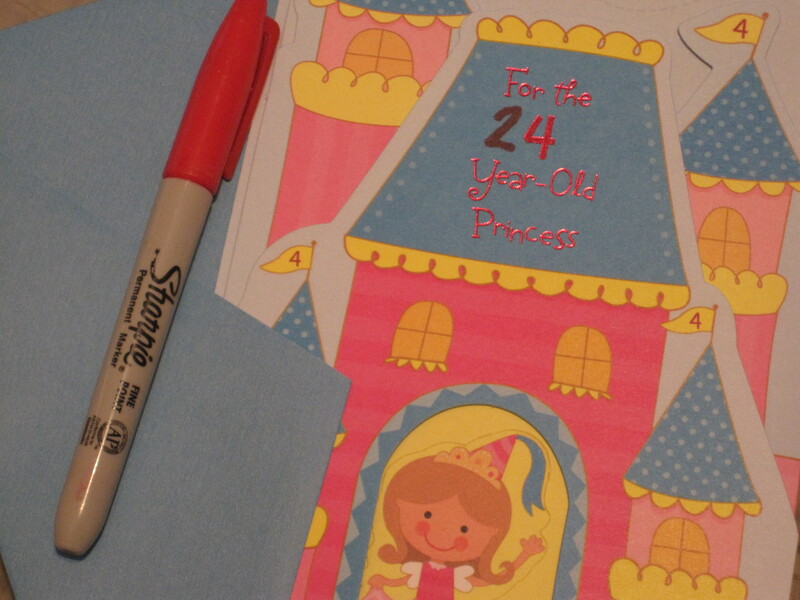 The store didn’t have any cards that said “Happy 24th Birthday,” so I had to improvise. But I must admit, they are totally worth the wait. Preparation is easy and fast, and the waiting goes by quickly (ish). A fair warning–the dough does not taste the same before it has been refrigerated. I tried a bit of it while I was forming it into balls and wasn’t too impressed. Then, after the truffles chilled and were dipped in chocolate, the result was absolutely divine. So don’t lose heart like I almost did! Oh! 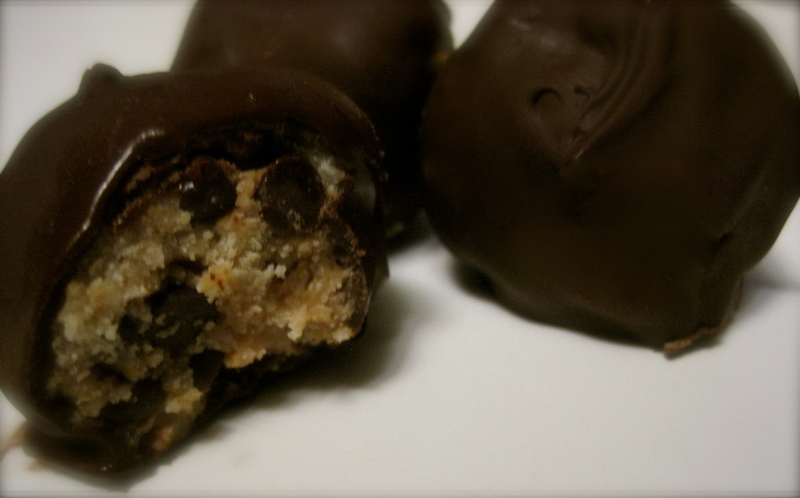 Also…you may be wondering why I only have three chocolate-covered truffles pictured. Well, it all goes back to being overexcited and underprepared to make these…I ran out of chocolate to cover the rest so they’re sitting in this tupperware container, waiting to receive the same loving treatment once I purchase more. Make these. Love them. Then come tell me about your love for them. 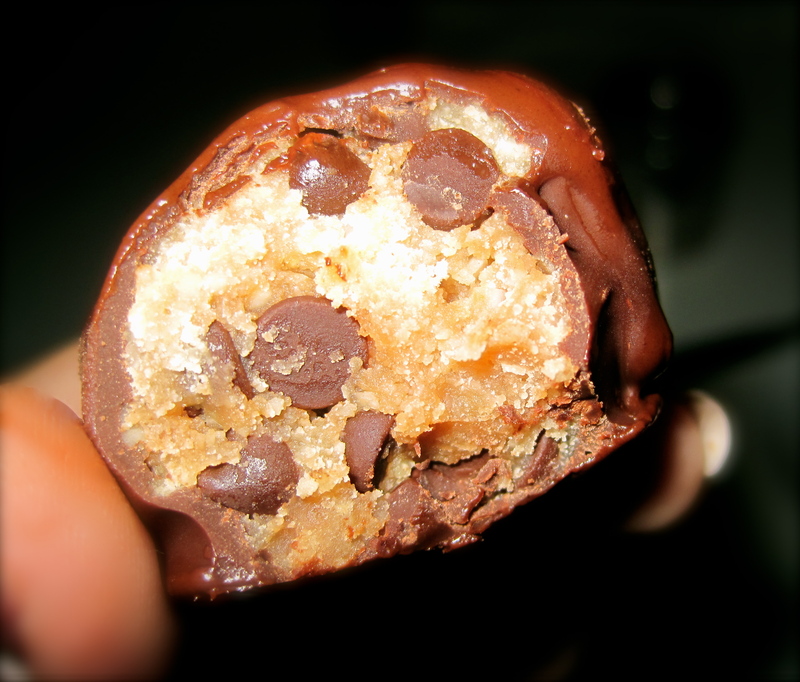 This entry was posted in Paleo, Recipes and tagged chocolate chips, cookie dough, dessert, food, paleo diet, recipes. Bookmark the permalink. I had a craving and these definitely hit the spot. I was afraid they’d be too coconut-y (I love coconut, but coconut flour and I just have not gotten along in the past) but you can hardly taste the coconut at all! I think it’s the generous amount of vanilla : ) Thank you for sharing this recipe! Now this is something I must try. It looks so good! You must! I guarantee you will not be disappointed!